The third part of our CPQ Perspectives series will focus on the manufacturers—those people who create and put together the products we buy and sell. While we have talked about CPQ for manufacturing companies in the past on this blog, in this piece, we will consider the people who actually participate and manage the manufacturing process itself, and the role that CPQ plays in their work day. People who manage manufacturing operations are concerned with several needs that frequently conflict with each other. Here are several examples. Manufacturers address these often-conflicting concerns through planning. Planning is what efficient manufacturing is all about. Planning is the “P” in both MRP and ERP. Look under the covers of almost any manufacturing automation system and you will see the phrases production planning and project planning used liberally throughout. 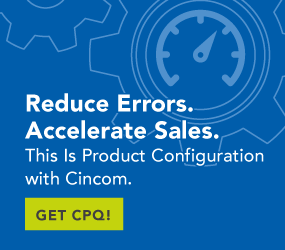 How does CPQ help manufacturers plan? Let’s review our concerns one by one and see how they can be helped with a robust CPQ solution. Production managers continually review the volume and type of work accumulating in their production queues. In many cases, this review even extends into projected sales numbers and pipeline reports from the sales operation. If those reports are not accurate, either due to unwarranted optimism or sandbagging, the planning process is inhibited. Managers are trying to figure out how many units they will need to produce in the next month or quarter and how many operating shifts will be required to meet that production goal. They also may be figuring out how many shifts per day will be the most beneficial in terms of adding capacity versus minimizing labor expenses associated with three-shift operations. Most selling cycles associated with specific products will experience interest peaks and valleys. Special sales, end-of-year promotions and marketing campaigns can help spread out that activity over time, flattening those peaks and valleys a bit and thus facilitating a spike-/dip-free manufacturing schedule. CPQ and CRM are useful tools for both facilitating that process as well as providing accurate forecasting information to planners who are allocating resources needed to accomplish those production goals. CPQ and CRM offer a variety of resources to help shed light on pending manufacturing requirements. CPQ can tell managers what items are in the inquiry, configuration or proposal stage. This is an “early warning” for possible inventory adjustments, production planning and scheduling. Further up the supply chain, this data can help ensure that externally provided parts and supplies are in the order queue as well. Load balancing is a matter of planning what resources are needed where and when in the production process. The whole process cannot move faster than the slowest point in the production process. Adding capacity at specific points in the production process to address the backlog at those points can speed up the overall throughput of the production line. CPQ can help with this process by identifying common assemblies and subassemblies used in multiple products. Demand history for those products can provide forecasting data to planners. Certain assemblies can be built in advance and held onsite, without boosting inventory costs, for use when needed by allocating unused capacity for this purpose. Due to rework, returns are directly impacted by CPQ. The configuration process uses interactive customer inputs to drive the product configuration process. This means error-free orders and error-free production. Products are built correctly the first time, and correctly built products are not returned by customers. Reducing production errors related to configuration issues and eliminating returns due to configuration errors reduces the overall cost of building those products. CPQ ensures quality and reduces costs. Achieving high production flexibility and reducing downtime related to retooling is aided by CPQ. Advanced knowledge of product demand means that earlier job scheduling can be completed to accommodate a wider range of product diversity on the same line. CPQ offers value to the makers by enhancing their abilities to plan production and gain earlier visibility into anticipated product demand. Longer scheduling views and more accurate inventory requirements reduce costs and drive efficient production processes.